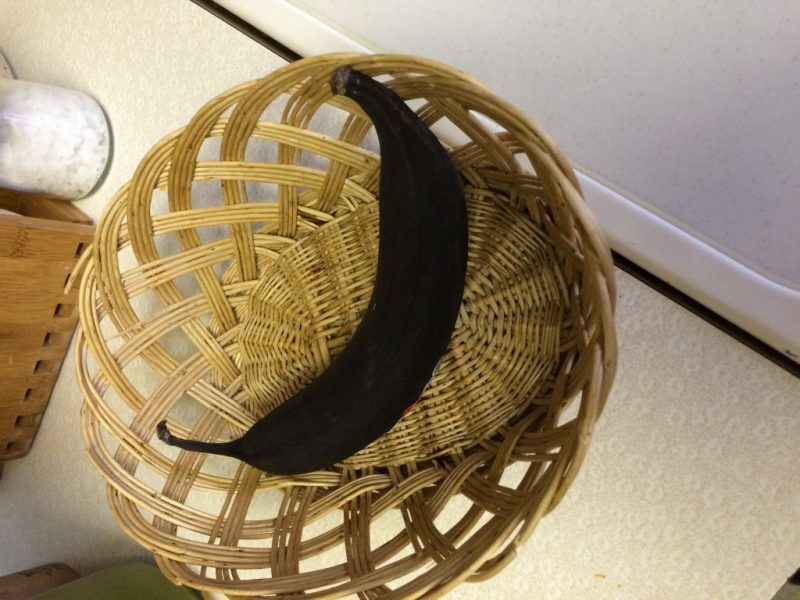 The Scene of the Crime……What’s with the Rotten Banana in the Basket? Welcome friends of old and strangers from distant lands. How are ya? I’m glad you all stopped by. Apologies for the lack of a post last week. 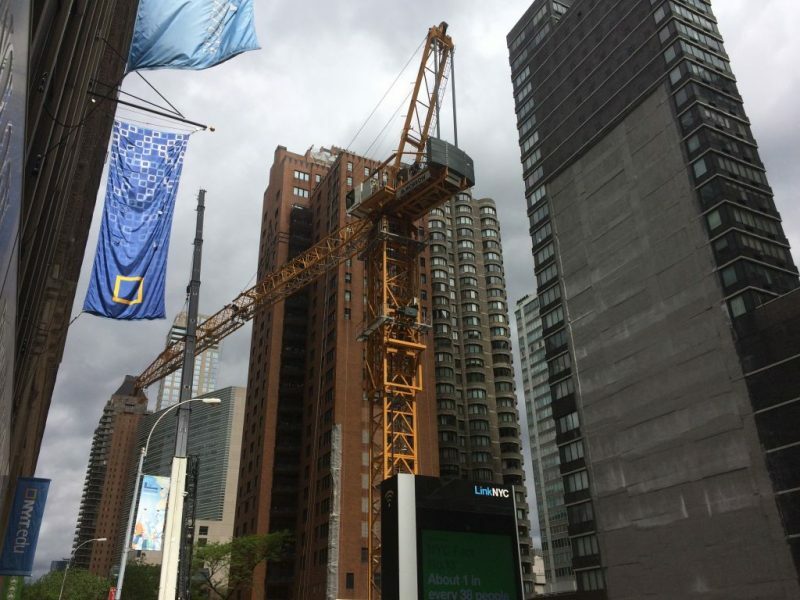 I was involved with the crane erection on 61st and Broadway last Saturday and Sunday. The whole two day ordeal on the weekends is really quite the bummer. Everything went smooth though and I actually got some paper work done that I was behind on so it wasn’t a total loss. Here’s a picture of the guys putting the boom together. Connecting the boom sections on the crane at 61st and Broadway. 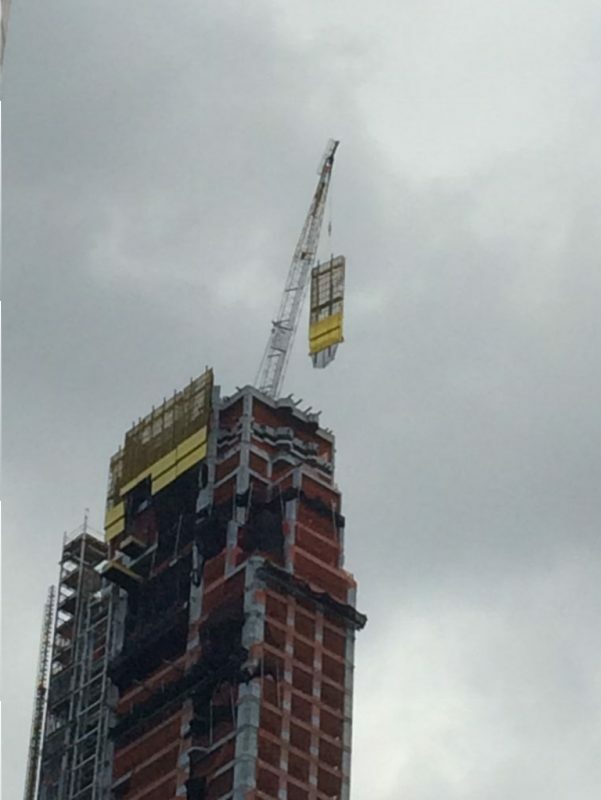 On another note we took down the protection screens over at 220 Central Park South on Friday. We’re getting very close to finishing over there. Very close. Hopefully another week and a half and we’re done with the crane there. I can’t wait. Here’s a shot I took of one of the screens coming off the top. A little hard to get the scale of things but that screen is 16×56. Taking the protection screens down at 220 CPS. So yeah the scene of the crime. You know where I broke my thumb, that scene. So if you recall I was installing the doorway opening into the kitchen when the crime occurred. 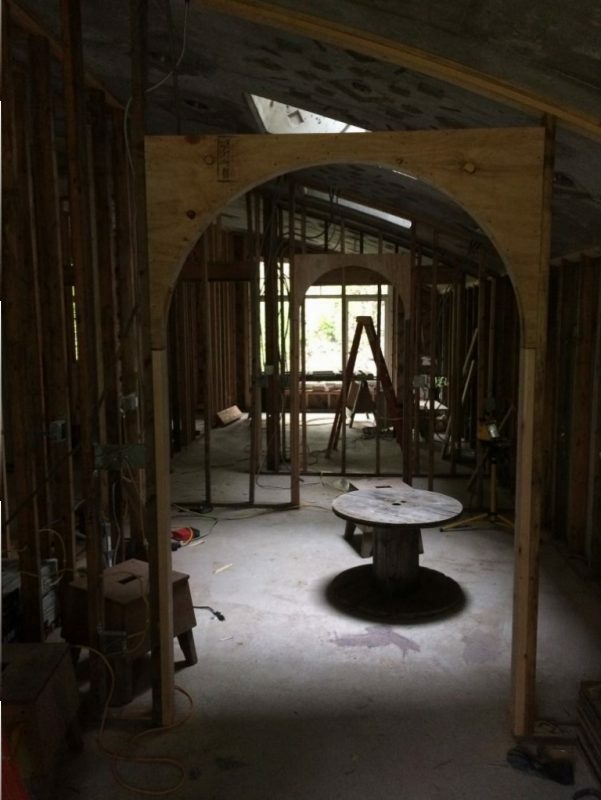 So I went over to the house on Saturday and figured I’d put the arched header into place and do some inside miscellany because it rained all day Saturday. So it was a snap putting it in but after I did I didn’t like the way it looked. At all. If it doesn’t have that Hobbit house feel something is wrong. Ethan was giving me a hand with some clean up and odds and ends and we looked at it together. Nah. It doesn’t look right. Check it out. 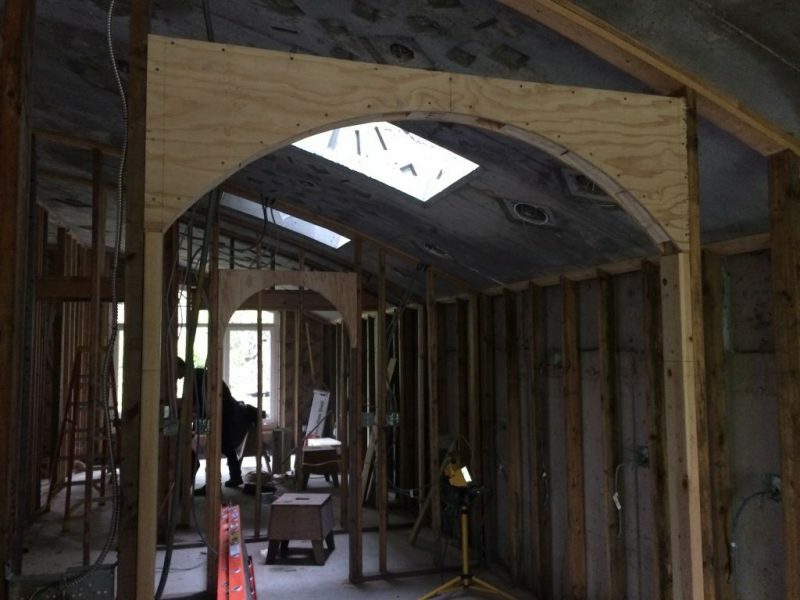 Arched doorway at the kitchen entrance. I think it’s kind of hard to see what I’m saying. You kind of have to step back from it a bit more. So step back! (Just kidding) We came to the conclusion that a semicircle would be better. So I had to go out and get two pieces of 1/2 inch cdx. It took about two hours but I think it was worth it. 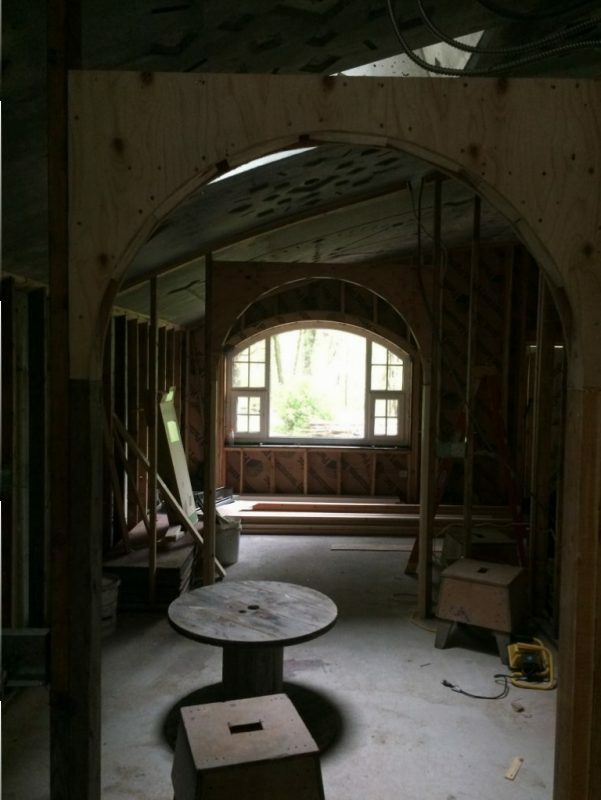 Semicircular arch into the kitchen. Taken from the dining room. Looking through the kitchen from the hallway. A bit dark but I think it’s going to look good when it’s all done. The semicircle is much smoother. On another note it was Mother’s Day today. Had to have another brunch with you know who. That was a brutal two hours of my life that I’m never going to get back. Happy Mother’s Day to all by the way! So I have to show you this one. This is from my side of the family. I stopped by my mother’s house the other day to check in. Look what I found in the basket on the kitchen countertop. Okay when I first noticed this black thing in the basket I’m saying to myself “Okay, Mom’s officially starting to crack up.” So I had to ask her what’s with the rotten banana in the basket? A little background. My mother would always save stuff that most normal people would throw out. You know like moldy cheese. And I quote:”That cheese is perfectly fine Jimbo. Just cut away the mold. There’s nothing wrong with it.” (My wife on the other hand looks at the due date on anything and throws it out if we’ve exceeded that date.) (There’s a balance there somewhere in between I’m sure but that’s not what this blog is about. )That was life growing up in my house as a child. I think that moldy cheese might be part of the reason there is something wrong with me today. But I digress. So when I confronted my mother with the rotten banana she says, “It’s not a rotten banana Jimbo (she still calls me Jimbo). It’s a ripe plantain! And I’m going to fry it up this week and eat it. They’re so delicious. ” She actually sent me an I-message of this exploded plantain saying how good it was. It’s probably one of those things that if you didn’t have to look at it it would be fine. It definitely was not something pleasant to look at. Went off on a bit of a tangent there folks. Sorry about that. I guess the whole point of the story is that if you saw what I saw on somebody’s kitchen counter top you would definitely be questioning that persons sanity. Oh yeah. Going to a black tie function this Friday night with the Editor. Had to get the tux and all. My brother is being recognized by the Concrete Industry Board of New York City. I didn’t even know such an entity existed. Who knew! At the Pierre Hotel in NYC. It will be interesting. Good God. Jude just got home from college and took his shoes off. I thought the plantain was bad. We had to call 911 cause one of the cats passed out. (Ever try to revive a passed out cat???) I made him put zip lock bags over his feet. That’s how bad it was. It was bad. Really bad. The Editor got out the hot water and disinfectant and made him soak his feet. Okay things are really going downhill so I’ll spare you the other incident I was notified of. Remind me next week to tell you what I found when I went upstairs. Well. Have a great week! Of Skylight Roofing…….What’s the Most Expensive Thing on the Menu???? Of Walkways and Garden Fences……And a Brother Recognized! Glad the thumb is feeling better. I do like the half round arches better than the original you had in there. At least I did until you showed the picture looking through the kitchen. Now I’m not so sure. There is something to be said for the arches matching all the way through to the arch over the front (back?) window. Hmmm…. Hey Frank thanks for writing. Yeah I know what you’re saying about the arch. Originally I was thinking that it would look good the way I had it at first. In a sense matching it with the arched window. But once I had it up and stepped back from it I knew it wasn’t what I wanted. It’s just a lot smoother. If that makes any sense. And I think it will go better with the circular hallway that I have planned. Glad your mom is doing well. How ’bout a picture next Sunday of you and the Honoree..would be nice to see. I just went to the CIB website and saw the ticket price…at that price, it better include a room at the Pierre Hotel !!! Hi Mike! Yeah I didn’t see your comment before the event. That was a good idea but we didn’t get a chance to get a picture together. Everyone had a nice time though. Take care and thanks for the thought.